Can I share file(s)/folder(s) via the web? What is the ‘Shared by me’ tab? Can I keep a track of all the files shared with me? When I click the share link, it says that it is invalid. Why? How to unshare files/folders that I have shared with my associates? Can I change the share permission of the recipient after sharing the document? Will my available quota (storage space in my account) be impacted when other IDrive users share files with me? Why am I denied access to edit a document shared with me? 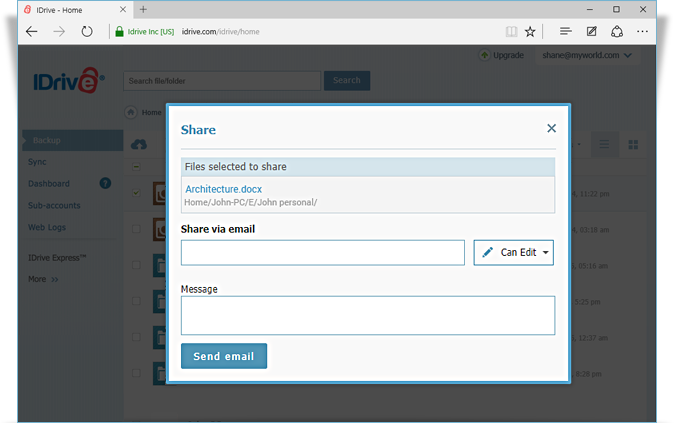 Yes, you can share file(s)/folder(s) with your associates via the web interface. Login to your IDrive account and select the desired file(s)/folder(s). The share window appears. Enter the email addresses in the ‘Share via email’ field. 'Can Edit' - so that the recipient will be able to edit the shared files online. ‘Can View’ - so that the recipient will be able to view the shared files online. Alternately, select the desired file(s)/folder(s) and click against the file names and then select 'Share'. The recipients must have an IDrive account to access the shared files. Sharing option is available for IDrive accounts with default encryption. You can view the list of share links of the files that you have shared with others in the 'Shared by me' tab in your IDrive account. Additionally, you can also edit the share permissions, unshare files, remove permissions for a particular recipient, etc. IDrive provides a centralized location for all the files shared with you. Once any files are shared with you, you will receive a link on your email address. Click on the link to view the shared files. The same files will also reflect in the 'Shared with me' tab in your IDrive account. If you are clicking the share link received in your email and it says invalid, it may be because the shared file/folder has been moved to a different folder or deleted from the user's IDrive account. Login to your IDrive account via the web and go to 'Shared by Me' tab. Yes, you can change the share permission of the recipient after sharing the document. Login to IDrive.com from any web browser and go to the 'Shared by Me' tab. Hover on the document that you wish to change the share permission for and click . The 'Sharing settings' window appears with the list of shared recipients. Edit the necessary permission from 'Who has access' section. No. 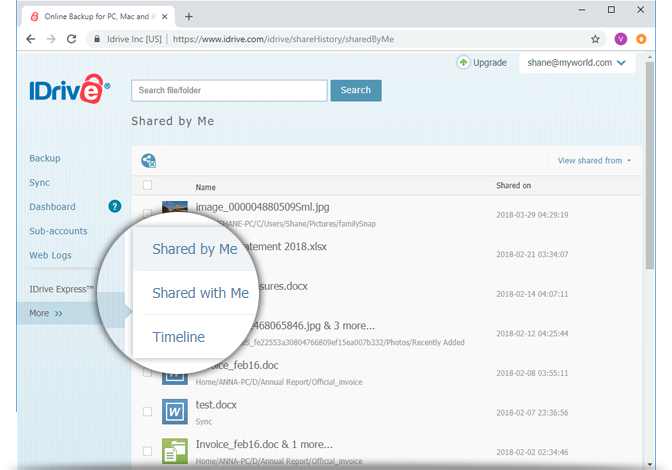 When other IDrive users share their files with you, it does not impact your account's quota, as your storage is calculated only for the files you backup and not for the files shared with you. You can edit the document shared with you only if you have been granted 'Can Edit' permission by the sender.